Zong Mobile Broadband Bolt+ device is wireless technology which Allows any Device to connect Like Laptop, Cellphone, tablet and IOT devices to a wireless broadband internet connection via mobile phone network. Zong 4G device is act as a Mobile Hotspot and it is a portable Device. It has the ability to connects more than 10 internet users simultaneously. With Zong 4G Bolt+ device, give fastest 4G services to their customers with more than speeds of 150Mbps on their Mobile Devices, laptops or any other Devices. 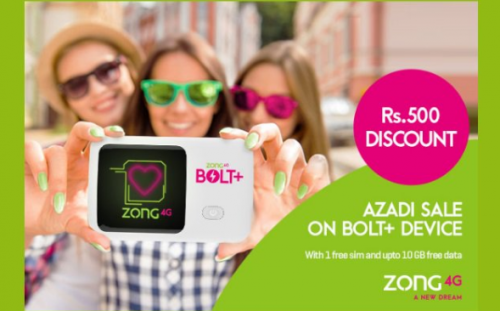 If you need Zong 4G Bolt+ device you can get it from Nearest Zong Customer Service Franchises customers can exclusively avail discounts on online Booking Zong 4G Bolt+ device. Visit Zong Online Shop and E-care for MBB bundles and much more easy activation please click here. First, go to the Official Site and Visit Zong Azadi Sale Offer Page. Now in Name required field Enter your Name in it. Next Select your City where you belong. Enter your Email in the required field. Select your nearest Customer Service Franchise Address. Which Bundle you want to active on Bolt+ Device Enter Bundle. Following these easy steps, you can avail exclusive discounts on Zong 4G Bolt+ device. Ease and Simple of use: Zong 4G Bolt+ Device doesn’t need any physical infrastructure can be used easily and reach each room. With Zong 4G Bolt+ Device, the customer has Internet access everywhere they need i.e. at home as well as on-the-go. Mobility: Unlike fixed broadband, mobile broadband can go with you anywhere you like i.e. when you are traveling or while going for shopping just don’t forget to carry your Zong 4G Bolt+ device along with you. Battery working time is 6 Hours whereas 300 Hours standby (Network Dependent). Fastest portable internet device with speeds of up to 150 Mbps. Plug n play- No software installation requirement at all, just plug the device and enjoy Zong Super 4G blazing fast speed.